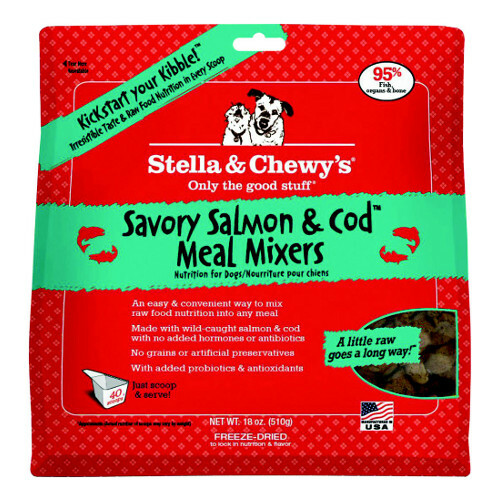 Stella & Chewy’s Savory Salmon & Cod Meal Mixers provide an easy and convenient way to add raw, nutrient-rich meat, wholesome fruits & vegetables, probiotics and antioxidants to any diet. Mixers are freeze-dried to lock in nutrition and flavor and are minimally processed. This tasty mixer is made with wild-caught fish with no added hormones or antibiotics. Just scoop and serve and watch your furry friend come running!